For a spooktacular treat to make, eat and share with the kids or for your Halloween Party, why not whip up these super quick and delicious ghoulish ghost pretzels this Halloween. With Halloween a mere day away and the Halloween weekend just passed, there is still so much time for ghoulish-scares and treats and these salty and sweet ghost pretzels will certainly be a winner for you and your guests plus your trick or treaters too. The ghost pretzels are a big hit in the London Mumma household and they never last long and we've made these 3 times over the weekend just gone, plus it is great that I have a handy helper who loves helping me out. So if you have kids or nieces and nephews, get them involved, nothing like spending time together and getting creative, plus they can help wash up too, not that you will have much washing up to do. 1. break up white chocolate into small pieces, par one for you to eat! Place broken white chocolate into a microwavable bowl and hit up for 30-40 secs and take out occasionally to give it a stir, to make sure that it has all melted. 2. Lay out your parchment paper and set to one side. Drop in your pretzels one at a time, take your fork and make sure it is all coated, then place your coated pretzels on to your parchment paper. Take 2 eyes and place on the top holes, repeat until all pretzels are done. 3. Place your parchment tray with your ghost pretzels into the fridge for 10-15 minutes until hardened, then serve. 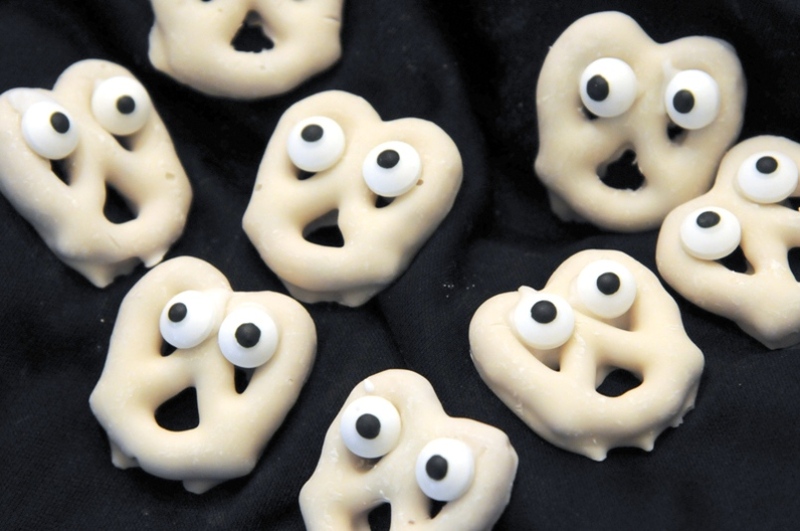 We hope you enjoy these ghoulish ghost pretzels, as much as we did. Happy Halloween!